Coming as what would seem perfect timing for all of those who vowed to get back into the gym this year, the GymPact app is now available in the Google Play Store. The app free to download and aimed at those who need some extra encouragement in getting to the gym and also those who like to be rewarded for following though on their commitment. 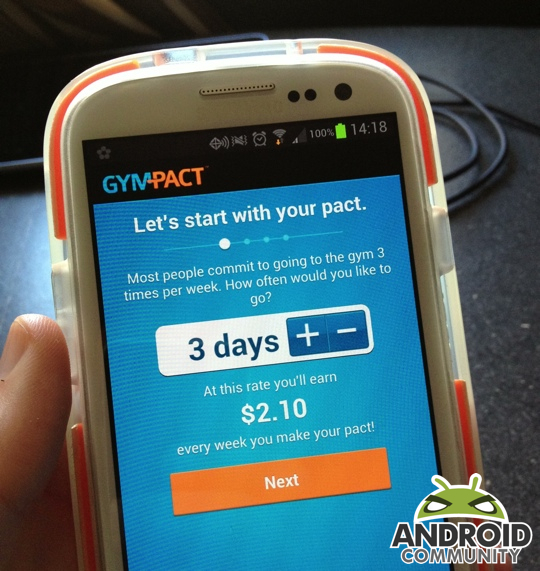 GymPact comes with the promise of helping to motivate you to workout with the promise of cash rewards, paid for by non-exercisers. And while we cannot say that will work for everyone, the folks at GymPact said they helped their users succeed on 86% of the workouts they committed to do in 2012.